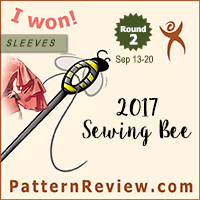 If a sewing-obsessed person can’t sew up the patterns they are dreaming of, they apparently buy fabric to make up for it. A lot of fabric. A lot a lot of fabric. Too much fabric. So, um, yeah, I bought a lot of fabric from Fabric Mart… But to be fair, they were having a crazy sale with designer fabric starting at $1.99 per yard! And silks at $5.99! Fabrics I had resisted for at least a month at full price, but I couldn’t seem to resist the bargains… Of course, in most cases you get what you pay for, and a lot of the $1.99 fabric isn’t quite what I was expecting. 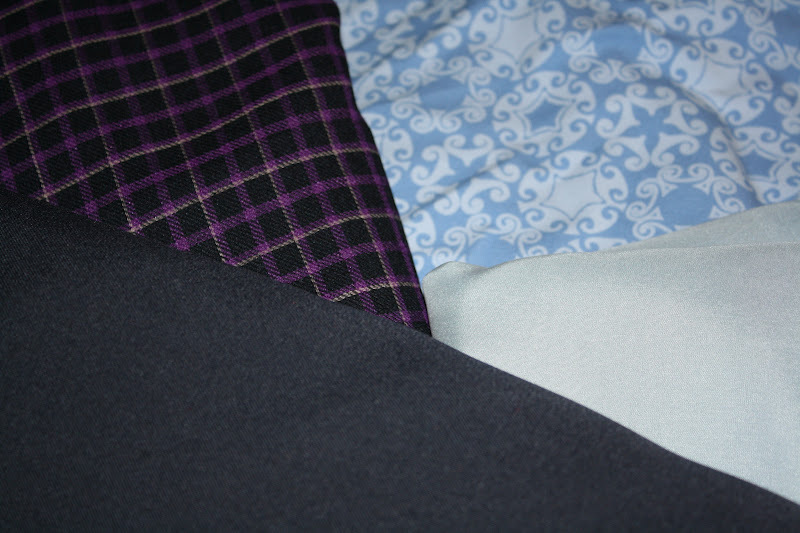 But I suppose that is just as well, I now have a lot of fabric for toiles and pjs. pale blue sandwash silk (heavenly soft! 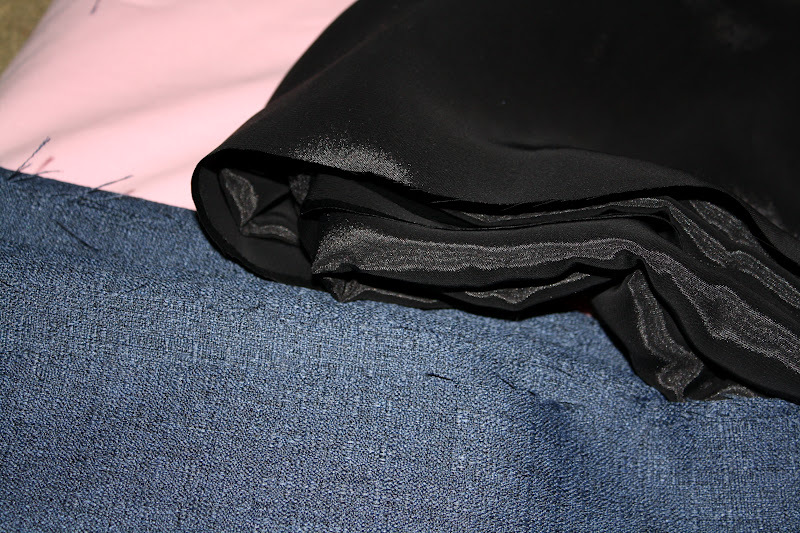 ), and navy poly/rayon/lycra for pants. but the nasty texture has relegated this to the muslin box. 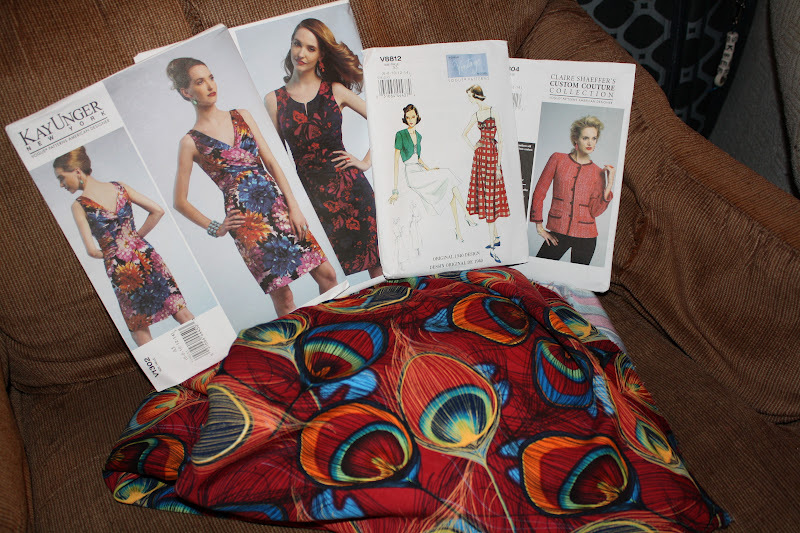 New Vogue patterns and my lovely rayon print! 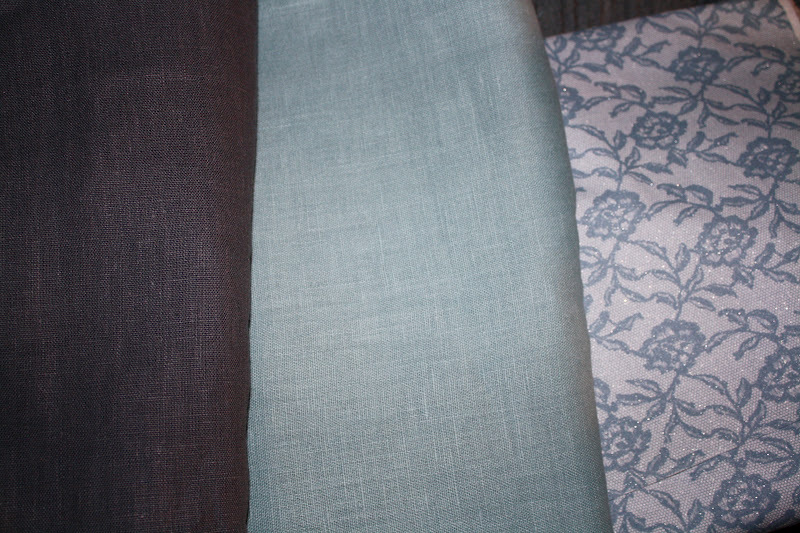 Left: dark linen, middle: light blue linen, right: cotton twill print. 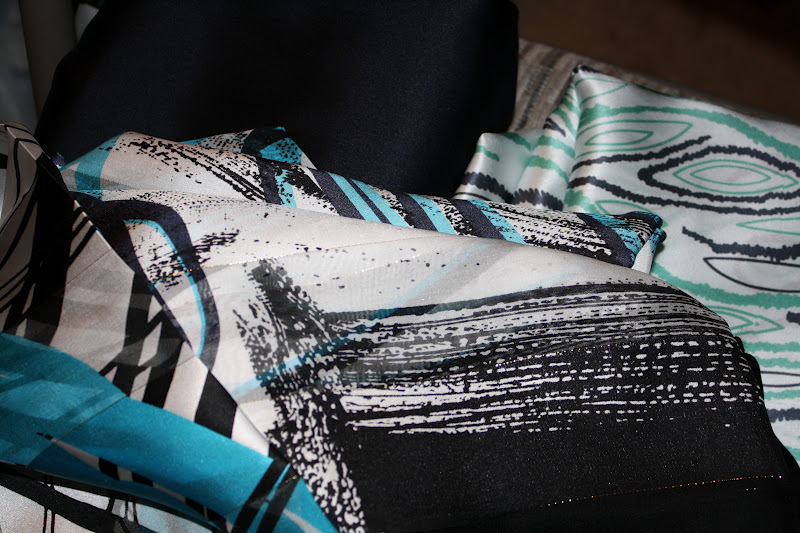 I am going to use the dark blue for pants, and the other fabrics for my Burda jacket. teal ITY-ish knit, and ombre blue Marc Jacobs cotton. My splurges – 100% silk! The two prints were clearance for $6 and $7 per yard, and the navy in the back was $10/yard. 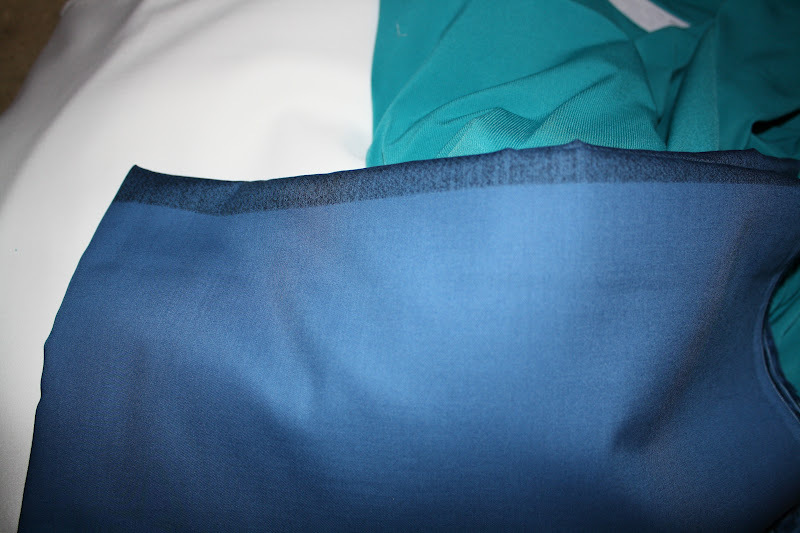 I have been looking for navy silk charmeuse for less than $20/yard for a while now – this stuff is just perfect for the project I have in mind. And, of course, I am still working on skating costumes, so I won’t be sewing any of this anytime soon. Sigh. I am looking forward to July. Yeah, teal is my favorite color. I also like blue, purple, and black. Also a lot of red. I am not such a huge fan of yellow or pink, and with green it depends a lot on the shade. Thank goodness my Joann has only the worst of the worst fabric or I'd be tempted to look for that peacock print. 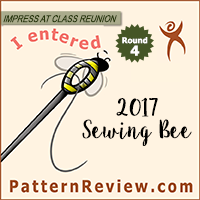 Love the haul–I'm having to live vicariously on fabric shopping right now. I have decided that I actually rather like it. 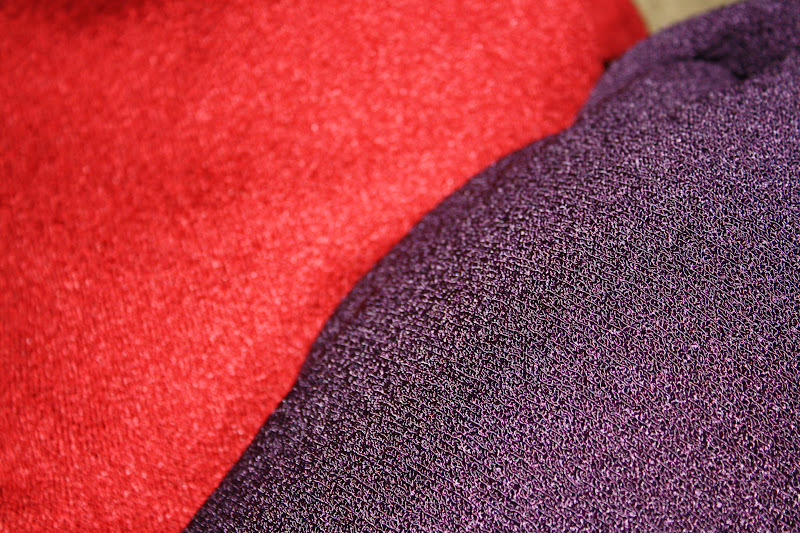 Of course, compared to the ugly grey fabric our club costumes are going to be made from, everything looks pretty. I think I am going to end up using this navy/burgundy stuff for practice costumes though. Although I do think it would look really awesome for test/competition with Fuchsia AB rhinestones, or maybe some Garnet AB stones? 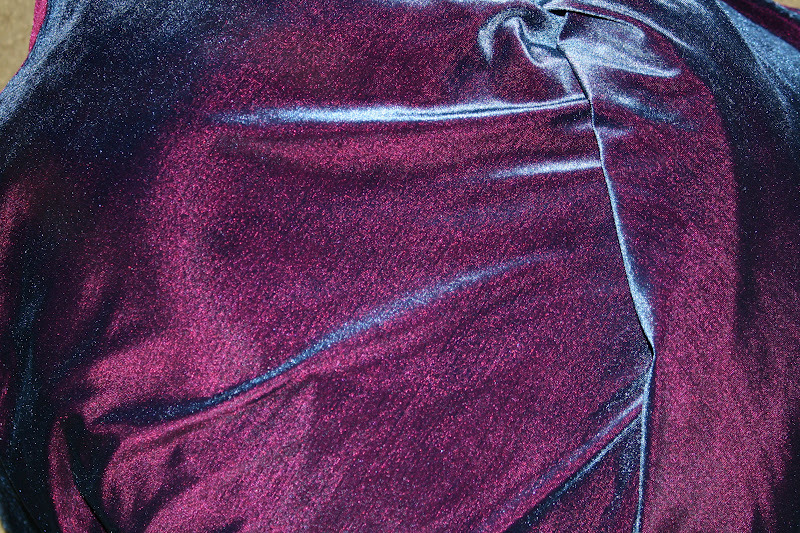 It isn't my most favorite skating fabric ever, but if I see good stretch velvet at $2.99/yard it is hard to pass up!